It gives me a little frowny face when people tell me that they can’t find good bread in America. But I’m turnin’ that frown upside down because the more I travel, the more good bread I see. And I love passing on the word because, really, everyone should have access to good bread – no matter where they are. The San Francisco Bay Area has had a tradition of good bread for a while, from the golden loaves of airy Boudin San Francisco sourdough, to the earthy levain breads from Acme, Tartine, b. pâtisserie, Della Fattoria, and all the other bakeries that are pulling terrific loaves out of the oven daily, in the area. People in San Francisco are obsessed with good bread, and good food – a tradition which I am happy to report is still in evidence from all the great meals I’ve been having on this trip. And like France, and many other countries, bakeries are important to the community. One bakery that is extra-special to me is The Mill, which I discovered on my last trip. And one that I was anxious to revisit on this one. It’s pretty clear when you walk into The Mill what a presence Josey Baker is in San Francisco. And his bakery seems to have become an integral part of the soul of San Francisco. With the wide open kitchen, surrounded by co-workers making coffee for customers, slicing bread for the famous toast, and greasing pans for the next loaves of bread to go in the oven, Josey stands in the midst of it all, mixing, stirring, and kneading, stopping mid-movement to race to the ovens, pulling hefty, rectangular loaves out with a lengthy wooden peel. It was a great welcome back to San Francisco to see him with his generous smile, clearly getting (and giving) great happiness from what he’s doing. And it’s my happy moment whenever I walk in and see him tending his bread. 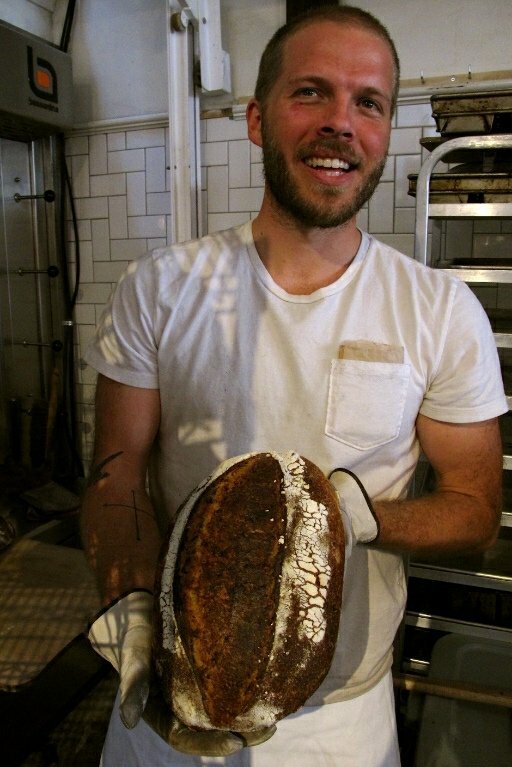 Josey is so into what he’s doing, that he wrote a book to share what his knowledge of bread making. But rather than just a book filled with recipes, Josey Baker Bread coaxes you into the process, starting you off with a very simple bread that calls for yeast (whose recipe title is “Your First Loaf of Bread”), then progressively moves toward teaching you how to make bread with a starter, demystifying the process, laying it all out in his plain, all-cards-on-the-table language. Because Josey believes that everyone should have good bread in their lives, even gluten-free people, he bakes up what he calls “Adventure Bread”, a compact loaf that’s hardy enough to get you through any adventure. It’s simple to make, requiring skills no more complicated than measuring or weighing ingredients, mixing them together, letting them sit together for a while, then baking them into a neat loaf. It’s the kind of bread that I like. 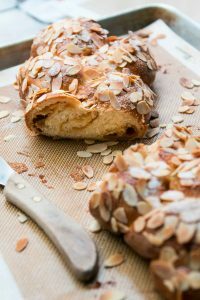 Packed with nuts and seeds, and good spread with a swipe of butter or nut paste, it’s hard not to love this bread. Just like it’s hard not to like Josey’s bakery, which was my first – and may be my last – stop on this trip to San Francisco. 1. Gather your foodstuffs. Toast the seeds. Preheat your oven to 350ºF (180ºC.) Spread the sunflower and pumpkin seeds on a baking sheet and toast until they start to brown, about 15 minutes, stirring halfway during baking. 2. Measure ingredients. Dump this stuff (all the dry ingredients) into big bowl. Then pour in the wet stuff. 3. Mix it all up. Oil your loaf pan, and then mush up your “dough” real good with your strong hands or a big spoon. Take pride in your mush-job; this is all of the handling you’re doing to do with this “dough.” Once it’s mixed real good, scoop it into your oiled pan and smooth out the top so it looks nice. Then stick it in the fridge and leave it alone for at least a few hours, up to a whole day. 4. Bake it. Put a rack in the middle of the oven and preheat to 400ºF (200ºC.) Remove the bread from the refrigerator and let it come to room temperature. Bake the bread for about an hour or so, then take it out and gently remove the loaf from the pan. Let cool on a cooling rack for at least 2 hours (YES, two whole hours). Don’t rush it here folks, this bread is D*E*N*S*E, and if you don’t wait for it to cool, it really won’t be as yummy. 6. 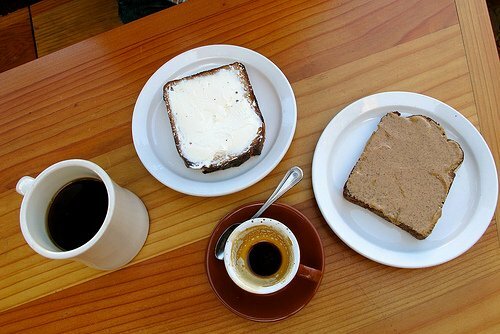 Toast and eat. This bread is definitely best sliced nice and thin (around 1/2-inch, 12mm) and then toasted up and spread with whatever your heart desires. And don’t worry if you’re adventuring somewhere without toaster access (like a gorgeous river in the middle of nowhere), it will still be scrumptious, I promise. – If you are making the bread for people who are gluten-free, be sure to use not only oat that are certified gluten-free, but make sure all the ingredients have been processed under gluten-free conditions. – I don’t know about substitutions. Most recipe developers test things many times, with various ingredients in differing quantities before settling on what they feel is the best version of the recipe. Generally speaking, liquid sweeteners can be swapped out (such as honey for the maple syrup) and probably some other flaked grains could be used in place of the oats. But not having tried them, I can’t say for sure. But I think the bread is pretty versatile and lends itself to testing out variations, as Josey did from the original recipe. – The recipe doesn’t say whether or not to cover it while it’s resting or being refrigerated. I don’t know if it’s important, but you could drape a kitchen towel over the top if you wish. I wouldn’t hurt. – If refrigerated, I would let the bread come to room temperature before baking. I have printed the recipe in Josey’s words, as I was traveling, but will add that to the instructions. This looks amazing. So generous of Josey to share the recipe. Thank you! Sounds wonderful! Just a note, if you are baking for someone with celiac, be sure to use certified gluten-free oats. What a great recipe, thanks for sharing, the bread looks delicious! What an interesting bread! Sounds really flavorful and unique. This adventure bread sounds awesome and not scary at all, I imagine the final result would be similar to Ezekiels bread? I don’t love that bread by itself but toasted with anything on it its amazing. What could I sub for the almonds if I am allergic to nuts? Would coconut work? I would use more seeds in place of the nuts, if you omit them. Mmm, this looks hearty! Two of my coworkers can’t have gluten—one is still in mourning as he just found out this week—so I’ll have to try baking this for them soon. David, kudos for dedicating yourself to posting and adding the usual beautiful pictures also when on a trip like the one you have been on, filled with appointments, work and things to do. Thank you! I’ve always dreamed of making my own bread! Thanks! I’m bookmarking this as one to try when I get back from vacation – it’s so hard to find decent, tasty GF bread. OMG! David, I saw this beautiful bread and thought how much I would love to make it at home. So glad you gave us the recipe!! My mouth is watering! Do the rolled oats equate to the same thing as quick cooking oats? Quick-cooking oats are thinner and smaller. If you can’t get regular oats, the quick-cooking ones may work, but not sure if they would work the same. If you do try it, let us know how it works out. Hmm..Im not sure if Im missing something in the Roots recipe but that exact kind of bread with its baking methiod has been used for a long time in scandinavian countries. So Im going to say that maybe that person was inspired by something in Denmark and that maybe its new to americans? Hmm..Im not sure if Im missing something in the Roots recipe but that exact kind of bread with its baking method has been used for a long time in scandinavian countries. So Im going to say that maybe that person was inspired by something in Denmark and that maybe its new to americans? I love this kind of bread, can’t wait to try it. Now I’m super mad at myself, though… I have everything but the psyllium seed husks and I was just at TJs this morning so I could have gotten some. Grrrrrrr. Looks too good to wait for! This is almost identical to Sarah Britton’s Life Changing Bread from her My New Roots blog. I am completely addicted to it! Morgan & Kathy: I’d seen that recipe online a while back and Josey cited that recipe in his book as inspiration for this bread, but told me he changed it – although he certainly acknowledged. Christina, i don’t have psyllium husks either, so i was googling around for substitutions, and apparently you can use an equal amount of ground flax or chia seeds, but you will also need to increase the amount of warm water you add. I made Josey’s delicious Adventure bread for Thanksgiving from a slightly different recipe published in San Francisco magazine. 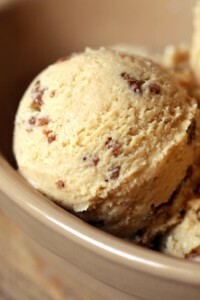 It contains dried cranberries and walnuts and some orange zest – just amazing. 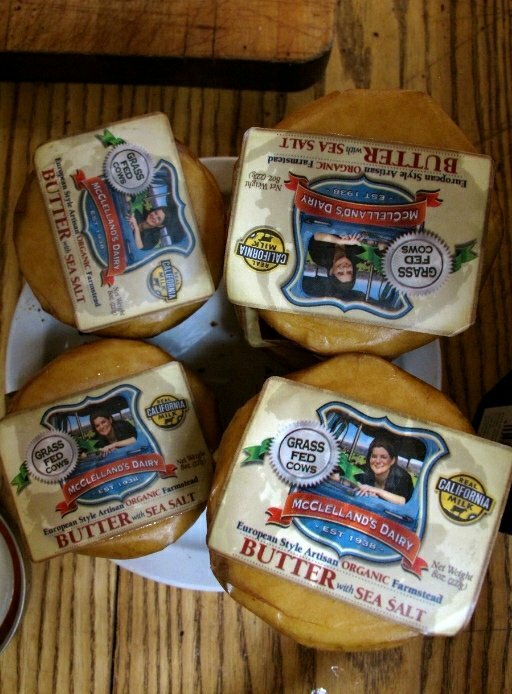 True, it’s dense, but toasted with a layer of cultured butter – it’s heaven! AND GF. 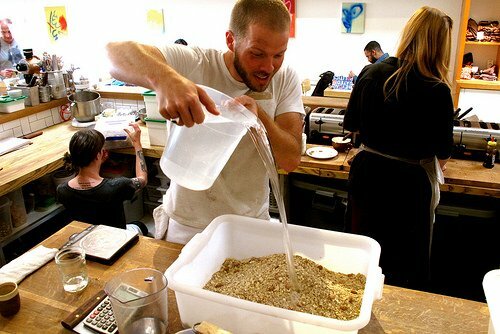 Be sure to “mush” your dough for awhile (Josey recommends 5-10 minutes), so that the oats combine with the seeds and nuts and make a very sticky dough. I agree. We have a vibrant bakery in our neighborhood that makes awesome bread, and it’s reflected by the insane amount of people who go there. There’s even a long line of people outside of the bakery waiting for it to open (every morning). Even in the Cleveland winter! I grew up in Puerto Rico, and we would only eat a fresh load of bread from a local bakery every morning. There’s nothing like it. People who complain about bad bread is because they purchase bagged bread at the supermarket. Try your local bakery. You will be happy. I hear that there is no problem with gluten in Europe. It supposedly is our flour here in the USA. Do you think that is true? Are the majority of Americans just going gluten-free thinking they will lose weight? A friend of mine who is Italian (who is in her 30s) was diagnosed with gluten intolerance when she was very young, and told me is was common in Italy; she said one-third of the people in Italy are gluten-intolerant. I do see a lot of gluten-free products in Italy and many gelato shops have gluten-free cones wrapped in plastic, so perhaps that’s correct? I don’t know about other countries but there are a lot of gluten-free things in England. David, my dad says its the closest you can get to Paris without leaving town is a visit to La Farine Bakery on College Ave in Oakland. The sour dough baguettes and croissants are amazing and rival the best boulangeries in Paris. Next time you are in the Bay Area, be sure to include it on your list of must do’s. Have a great rest of your trip! David, I know this isn’t your recipe but do you know if the cold pre-baked loaf needs to set on the counter to warm before going in the oven? If you know of any good bakeries in the Tempe/Phoenix area please do tell!! 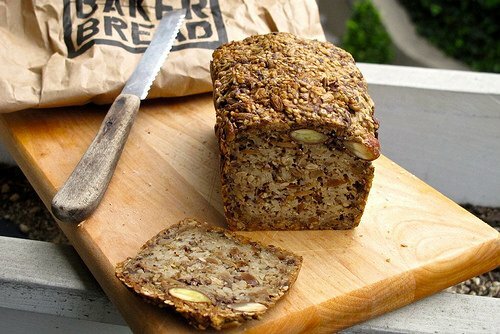 I’ve moved here from New Zealand and I’m finding the bread here terrible :( In NZ our supermarket breads – while not artisan – are really quite good, some filled with seeds and grains. I cannot stand most of the bread sold in grocery stores here, texturally spongy, strangely sweetened, just awful. This is extremely similar (identical?) to the Life Changing Loaf of Bread from the blog My New Roots. Shouldn’t the baker at least acknowledge that that is where the recipe came from? There are enough blog readers out here who recognise it, otherwise it is plagarism…..
By the way, it is a fantastic bread! The ingredients are very similar to Life Changing Loaf of Bread from My New Roots (who btw doesn’t claim to have invented it). But ratios and method is somewhat different. So I think it’s fair game. I imagine that toasting the nuts and seeds first will make a big difference in this already very good bread. Thanks for posting, will definitely try this version. Lise and Jayne: As I mentioned in a previous comment, in his book, Josey did indeed cite in his book the inspiration for the bread was that recipe and blog post, which he adapted for his bakery, changing some of the ingredients and the quantities, in the book. David D: Josey’s recipe doesn’t say to let it come to room temperature first, before baking. It probably wouldn’t hurt, but since I’m traveling, I can’t test it out to see. If you do try it, let us know how it turns out. Brenda: Glad you liked the interview! It was fun to chat with them. Sarah, at mynewroots blog, said she found the bread when she went to a friends house for lunch. She said she spent time in Denmark so not sure if the friend was in Denmark or here in the US. Bonjour, Monsieur. So far I’ve made the mustard chicken, leeks with mustard vinaigrette, and the roasted tomato with goat cheese crostini from “My Paris Kitchen”. and all were a huge success. I had the pleasure of meeting you at the Dallas book signing (I brought you Junior Mints) and I am looking forward to making many more of your recipes. It was a thrill to see your recipe for Steak Frites in this week’s issue of “The Week” (May 09) in the food & drink section. Well done! As always, merci beaucoup for your delightful and informative blog. As others have commented, we have coffee together almost every morning. I think people hesitate to pay “that much” for toast as bread is no longer seen as a staff of life but just some kind of background, even “good” bread such as artisan baguettes. With the ingredients and labour involved, and a restaurant markup, that is not overpriced at all. A good byow restaurant near my place got some criticism for charging a small price for their bread. This price is not the (dastardly) Italian “pane e coperto” charge; they make their own breads on premises and have a choice of them. Indeed there are a lot of gluten-free foods available now in Italy, but there are also a lot more wholegrain items (with gluten) such as wholemeal, kamut and spelt bread, and the “farro” (a softer Italian grain similar to – or a variety of – spelt). I’m glad Italy is so attentive to gluten intolerance and allergies in general, which was NOT the case a generation ago, but find one third of Italians suffering gluten intolerance a bit hard to believe. There are some excellent Germanic and grain breads in Paris for sure. I did a round up a while back of a few of my favorites. I am a big fan of both you and Josey Baker and it was a wonderful treat today to get your email with my two favorites. I bought the Josey Baker Bread book back in April and have been blasting through the recipes. I highly recommend it. Anyone can make delicous homemade bread, especially with Josey’s guidance and recipes. My husband is loving that my bread making skills have gone from primarily making baquettes to now making artisan breads and pizza…thanks to Josey’s book. My boules used to be unappetizing to look at and just ok to to the taste. Now they look beautiful and are crazy good….just like Josey’s. Thanks for sharing David & Josey. You make our world better. 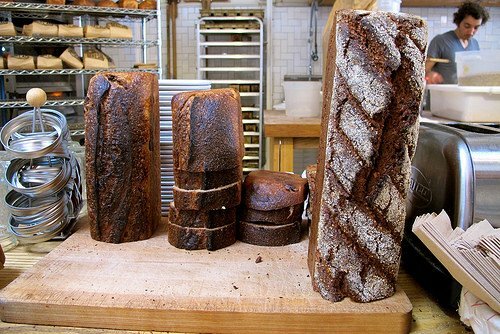 Ever since your last visit, Josey’s Bread has been my go-to bakery, especially for his amazing Dark Mountain Rye. I change it up with Acme’s Multi-grain Spelt loaf, which sometimes feels more like penance than bread. As another commenter mentioned in another post, how crazy is it that we decide where to go in our city based upon the recommendations of a guy who lives in France ! Thank goodness that guy visits often. At the farmers market in Bergerac, France (where I spend my summers) a guy sells bread from wheat he grows, grinds and bakes himself – Josey will have to get a couple of acres. The organic store I also shop at in Bergerac has a sarrasin (buckwheat) bread that is even more like penance, although it would be my go-to loaf if I heard a burglar trying to get in. The photographer for Josey’s book is my good friend’s daughter (Erin Kunkel). So I’ve read all about him…though never tasted his breads, which look amazing! Just verifying-there is no leavening in this bread? 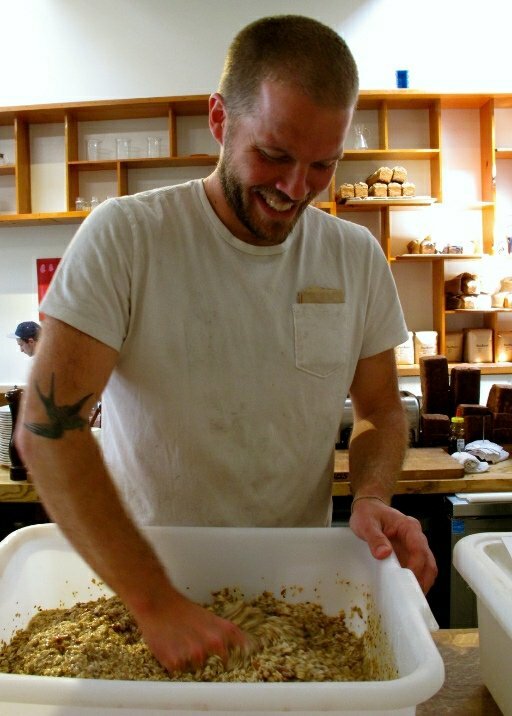 ” And it’s my happy moment whenever I walk in and see him tending his bread.” I can see where it would be a happy moment just walking in and seeing him smile while standing behind the counter. Forget the bread. Making good bread is an art and requires technique which only comes from repetition. And, of course you need a good recipe, like; salt, water, flour and yeast. Soooo, why is it so difficult????? Love your blog, love your books (My Paris Kitchen) is sitting next to me at the computer while, “The Sweet Life In Paris” is someplace, I’ll bet one of my sons who cook took it! Your books read like novels with recipes. Oh, I’ve not kept up with your posts..sometimes when I’m so rushed I just look at the pics and save it for later..I’ve saved every one of your emailed posts…anyway, so you’re back in our neck of the woods! 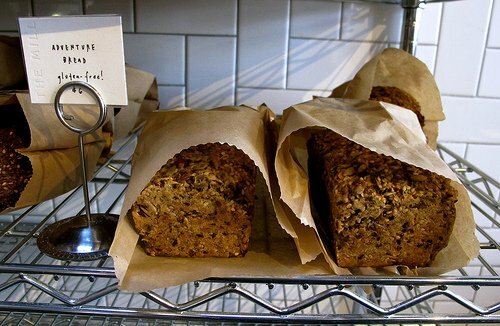 I live in Santa Cruz, about an hour and fifteen south of the Bay…REALLY glad to hear about this bakery..will visit soon. I’m actually going to get his book…I’ve always had a time of it with making bread, which never makes sense to me, it seems so simple…this sounds like the answer though. I’m glad you’re having a good trip so far..can’t wait to see where else you stop in San Fran..enjoy! Thank you so much for this recipe and introducing us to Josey! PS -I am gluten intolerant, so am always looking for a good bread. Miss it terribly. At first glance, I thought “another delicious recipe I can’t try”. I recently found out that I have celiac, so I’m thrilled that you all shared what looks to be a fantastic gluten-free bread. Thank you so much! note- this bread MUST be toasted. excellent w/ avocado. Making today as a Mother’s Day treat for myself! Thanks! This bread looks amazing. I am unable to eat grains of any kind so do you think I could substitute almond flour for the oats? Here, the supermarkets do offer a range of gluten-free foods, but people who have coeliac disease, or who are allergic to it, must avoid all traces of gluten. The former runs in my husband’s family, and two of his siblings have it. 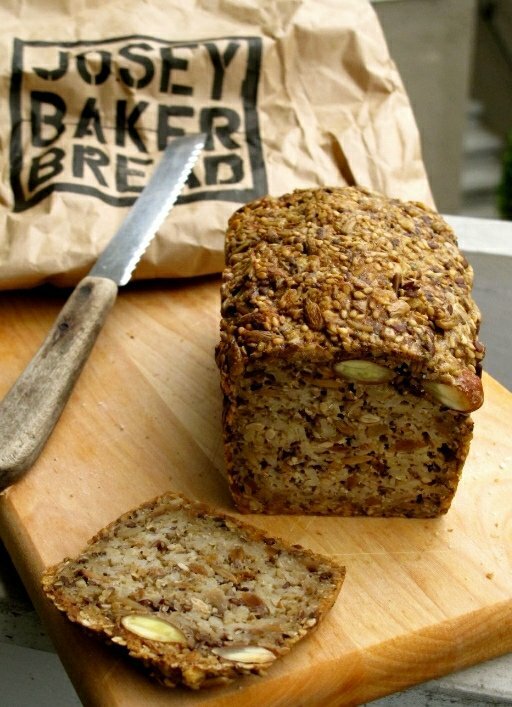 Another friend seems to be allergic to grains, not gluten – she can’t even have gluten-free oats (and if you are going to make this delicious-sounding bread for someone who has coeliac, then you need to be sure that is what you have bought). Those who simply have to avoid wheat can use ordinary oats, of course. It does sound delicious. In the UK, you can get psyllium husks from Holland and Barrett. Also, in my part of South London there is a splendid bakery that sells toast – you sit at a table with a toaster, and toast your own! Rye, and sourdough, and… mmmm…. There are good bakeries in the States, but they’re not everywhere to be found. So yes, in Miami, or Boston, or San Francisco, or other similar town, but not everywhere (as they are in France). For example, there is a bakery in Key West, but that’s 20 miles away. Otherwise it’s supermarket bread. Similarly in Albuquerque, there were some not-bad breads from Sage bakery (not great, either), but they always sold out fast. So for the past 25 years I’ve been making my own breads, generally sourdough. Always better than the breads available locally, and a LOT cheaper. The time I spend living in France, I buy bread, of course. Re people complaining about the cost of a slice of fabulous toast or similar , I am constantly amazed that the same complainers will, in New Zealand anyway, happily pay even more for a cup of coffee. This looks fantastic! 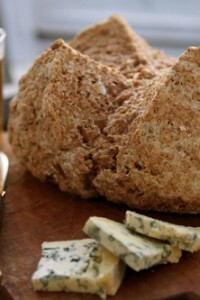 I love dense, hearty breads and I can’t wait to make this! how does it rise without some kind of leavening? Nilla: There are a number of German and Scandinavian breads that are dense and made with a batter, more than a dough. Gluten-free people use psyllium husks to get the “glue” in place of flour. But I love any dense, grainy bread..no matter what. Thanks for another great post. I zip thru my email looking for your emails. All of your stops have been so interesting. Also love the photos, thanks for taking the time to keep us connected. I just returned from the store and stocking up on the ingredients needed for Josey’s bread and quickly ordered his book. For years I have made something similar but it contains yeast. So I am very interested in this one. BTW that Josey is quite a cutie pie. Ps my husband asked me to pick up razor blades and they were $32.00 so $3.50 for yummy toast doesnt sound so bad. No wonder he charges $4./slice — I bought everything to make a loaf of adventure bread and it cost over $30. Everything but the psyllium husk and maple syrup was bought in bulk. Need to find psyllium husk in bulk — it was $15. Try Trader Joes, they sell a 12 oz. container of it for around $6+ by the dietary supplements. I find it ironic that his last name is Baker- do you think its really his name? But then again my dog stays at a kennel owned by people with the last name of Barker (real name). Psyllium is a laxative so it would make eating this bread very interesting…later. The seed is the laxative, the husk is fiber, lots of fiber. Good to meet you at the Omnivore Bookstore this afternoon. Thanks for signing my book. Sorry I didn’t speak up. I asked how it was going. Hubby said he didn’t even hear me. So I doubt you did either. Then I got shy. Sigh. Hope the book tour is going well. Sometime it would be nice to know where you went around here. I’m sure you have your favorites. You seem like a good guy. The psyllium husks were in the “whole body” section of my Whole Foods being considered more medicinal/supplement like than food like. The bread is amazing and will keep me full until lunch rather than making me hungry two hours later. I live off the grid in the Sierra Nevada foothills and don’t have a toaster. I toast bread by heating a cast iron skillet, throw a sliver of butter into the hot pan and place slices if bread over it. When one side is brown I flip the slices. Latest improvement is to weight the slices with a grill press I found in a thrift shop. Sublime! i love this bread ..
your all other post really practicalized…. Sarah (the writer of mynewroots.com) who is the person Josey acknowledges he got the idea for the bread from, says she found the bread at a friend’s house while she was living in Denmark. I would like to know more about the bread there and wonder if it is a common bread found in Denmark. In Step #3 (“Once it’s mixed real good, scoop it into your oiled pan and smooth out the top so it looks nice. Then stick it in the fridge and leave it alone for at least a few hours, up to a whole day”), should I/we/the-people-who-love-bread cover the dough once it’s in the pan before putting it into the refrigerator? To avoid the top getting (forgive me, as I don’t bake often and don’t know if there is a term for this) “weird” – that sort of dried-out-like “skin” on the top? Here is to hoping someone knows what it is I’m talking about! Any suggestions for a good substitute for the rolled oats? I want to make this for someone with celiac, but they cannot eat even the certified gluten-free oats, so I need to find a good alternative here. Thanks. @ Mark, try to find rolled quinoa, it’s great. Some health food stores sell it in the bulk section, otherwise it’ll be boxed with other specialty grains at places like Whole Foods. Also, @Mark, just realized rolled quinoa won’t contribute to a sticky dough the way oats would. So you might need more psyllium, etc and the whole thing could get tricky, ratio wise. But would be a fun experiment. As usual, a mouth-watering recipe! I have a question if I may (it might not be a very bright one :) but I don’t usually bake bread so my knowledge is rather limited), can the maple syrup be substitued? or even better, not use any sweetener? I’m not a fan of sweet bread. I like the sound of this bread. Going to try it. Since I first heard about $4 toast, I was behind the idea: we have no problem spending that on a good pastry – and good bread takes as much skill and artistry to produce! I made it. It’s delicious. And very very heavy. And chewy. And did I mention delicious? I toasted a slice and topped it with ricotta and sliced strawberries, mmm! I baked it for 1 hr. 15 min in a regular size (glass) loaf pan. 1 hour didn’t seem enough. I am wondering if I can substitute flour for the psyllium husks? Thank you for the recipe! Gonna try it tomorrow. There might be a problem with the psyllium for people who take certain medicines on regular basis. Better for them to consult before using. And, it is suggested to drink more water. I made this yesterday and it’s excellent! Just a note on using vintage Pyrex. I used my grandmother’s Pyrex loaf pan for sentimental reasons and because it fit the dimensions suggested in the recipe. I did not put it in the refrigerator before baking, but left it out on my dining room table to hang out for two hours before baking. No problems to report! I made this yesterday for my visiting german relatives, and we all love it! One question: how is it best stored? Sliced, then frozen? Whole, in the fridge? I’m afraid if I leave it out, it will get moldy, which would be very sad!! I made this the other day. Delicious and very filling. As a general note: Please do not make this bread for anyone who is coeliac or gluten-intolerant unless you use certified gluten free oats. I’m surprised the recipe labels the bread gluten free without specifiying this. In addition, many coeliacs are also sensitive to avenin, the protein in oats, which is not gluten but is similar to gluten in structure, regardless of whether the oats are certified gluten free or not. In general: do not put oats in anything that you are serving a coeliac without asking them first. The idea that oats are gluten free is making it harder and harder to eat safely… recently I’ve had to add ‘yes, but are there oats in it?’ to my list of questions. I’m coeliac. I’ve made this bread (following the mynewroots recipe) by subsituting rice flakes, buckwheat flakes, millet flakes etc. for the oats and it’s still delicious. Hi David, thanks a lot for sharing the recipe. There is an error on the link “psyllium seed husks” you might want to fix it. I made this yesterday, and it was quite the hit. I mixed it up in the evening, and put it in two small loaf pans and refrigerated them overnight. I had to be out and about for several hours before arriving at my guy’s house, so the unbaked loaves sat in my bag for four hours before baking (the bread doesn’t rise at all, so deflation wasn’t an issue). With the dough at room temperature the half-sized loaves took the full hour to bake, so I’m not surprised that when baked as a single loaf it took more time. There were some “oops” moments with measuring (accidentally left out the chia seeds! ), but it’s a rather forgiving loaf. I’ll be making it again soon. A couple of slices should make a nice sugar-free alternative to energy bars. This recipe is a keeper. I notice this recipe does not have a leavening agent (yeast, baking soda ect.) Is this accurate or a mistake? michelle: There is no leavening in the bread. Paula: Thanks – I fixed it. Cover and refrigerate or just refrigerate. Any idea what the internal temperature should be on the finished loaf? I love my thermapen! I cook all that we eat at home: bread, cake, dessert … Thank you thus for these recipe, and thank you for sharing with us your discoveries. You are so right about Josey and his bread. His enthusiasm seems to permeate the whole bakery. I confess that I haven’t tried the Adventure Bread, but the rest of his work is just amazing. And we’re something like bread snobs in San Francisco. His bread definitely measures up to the other amazing bakeries that have found a home here. You continue to provide great recipes, wonderful pictures, and words that just sing off the pages. Although I wish you were back here concocting your desserts in some classy SF restaurant, I am secretly pleased that I get to read your stories and your adventures on the net. Thanks for another terrific piece of work. I made this over the weekend and my gluten-free and non gf friends were pleased. Butter, salt, and jam made it over the top. I didn’t have pumpkin seeds so I just used sunflower seeds; subbed honey for the maple syrup. I let it sit out on the counter, covered with a towel, for 6 hours then baked the loaf. So happy that the measurements were in grams, very helpful. Made the bread — it’s a snap, really. I used the stand mixer instead of hand mixing. It’s hearty, seedy, and oaty. One slice with cashew-macadamia nut butter kept me going until lunchtime. I borrowed Josey’s book out from the library and made this bread. It’s delicious and so easy. I refrigerated it, covered loosely in plastic during it’s ‘rest’ period. I don’t think that it’s necessary to even cover it, this bread is not going to dry out. As for the baking time, an hour seemed right (it produced a bread just like your photo). Someone asked about bread temp, but I don’t think you need to be concerned about proper temperature because this isn’t a traditional wheat-based bread and none of the ingredients need to be cooked to a safe temperature. I do want to emphasize that the seeds should be toasted. Toasted sunflower seeds is such a revelation. I never knew that it could smell sooooo good and add so much flavor to the bread. Definitely making this again and I’ve never been a fan of gluten free products or seed bread. I made this for my coworker that is not only gluten intolerant, but dairy intolerant. I did take a risk by not pretesting it, so she was my guiny pig. Please share with Josey that she and another coworker applauded me for baking this bread. It put a huge smile on my friend’s face and her tummy. This bread is absolutely TERRIFIC!! and so simple to make. We are trying to avoid most grains and this bread certainly fits the bill. Gluten free or not this is really a wonderful loaf. Only substitute I made was rice malt syrup instead of maple. It will definitely be a regular loaf in our house. Thanks so much for the recipe, David & Josey. I just made this bread yesterday and it’s perfect! As a gluten-intolerant NZer living in the States, I really missed the wonderful seedy breads from home. This bread really hits the spot. Thank you for sharing! I look forward to trying this recipe but in the meanwhile wanted to tell you of this hidden gem. Lighthouse Center is eight miles off the I-5 from Sutherlin, OR, and is in the middle of nowhere….really. It shares a structure with a small post office surrounded by pastures in the town (?) of Umpqua. That’s all there is In this ‘town’. They are first a bakery that has amazing bread. The café serves lunch and uses the bread, (always), and produce which they grow, whenever possible. There is also a small health food store all in the same large room. It is packed all during the lunch time even though everyone must drive a bit to get there. The food is the freshest, hands down, of anywhere I’ve had the pleasure of dining. It is vegetarian (not vegan), which we are not but it is our favorite eating establishment. I don’t know if you will ever be in this area (but maybe since it is being noted for wine), but go off the beaten path is the opportunity arises. OMG this recipe is to die for! I can’t wait to try this. It reminds me of those luscious crackers they always have to sample that I buy at Whole Foods. I can see slicing this paper thin and toasting/roasting and eating like a cracker. Great recipe! Thanks for sharing this. FYI, my local Earth Fare store has psyllium husks in their bulk spice section so you can get just what you need.